Fell Running Briefs: Make mine a double! The series started with a Medium category race in Church Stretton on the Long Mynd with a win for Lloyd Taggart and a second for Chris Steele. The runners shifted to Mearley Clough, on the back of Pendle Hill, in May for a short fast up and down, a win for Simon Bailey and second for Ben Abdelnoor. Quite a few runners decided to opt out of the Lakeland Classic Duddon in June hedging their bets to be fit for the Sedbergh Hills Long counter in August. Just three weeks after Duddon, they met in the heart of the Lake District for a Medium at Ambleside’s Loughrigg & Silverhowe. Rob Jebb won Duddon with Ben Abdelnoor second, Jebby was second to Ian Holmes at Loughrigg. July came and the next stop was Whittle Pike in the Rossendale Valley (incidentally where ‘Survivors’ a cult TV series was filmed, about a group of nuclear holocaust survivors who formed a weird kind of community - but not so weird, as no episode featured a jog up Whittle Pike). It wasn’t a good day for Rob Jebb, he fell and dislocated his shoulder, he didn’t complete this race or attend the last counter. Ian Holmes, who suffered an injury at Borrowdale Fell Race, did not attend the last counter of Sedbergh either, leaving the door open for Lloyd Taggart, Ben Abdelnoor and Chris Steele to get a look in on the medals. Lloyd Taggart shot to the top of the table with his second place to Morgan Donnelly at the Long Sedbergh Hills race. Ben Abdelnoor finished fourth, Chris Steele, whose legs weren’t having a good day, jogged in with a team mate in 35th. Lloyd’s second place put him at the top of the MV40s table too – the fist time, according to published records (that’s back to 1986! 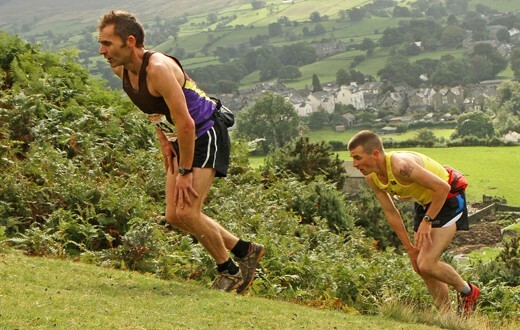 ), anyone has done this in the Fell Running English Championships. That’s not the only ‘making history’ event this year, as never before has one club doubled up and won the Open and the MV40 Team prizes in the same year. That honour has gone to 90’s super club Borrowdale FR who have proved they shouldn’t be written off just yet!